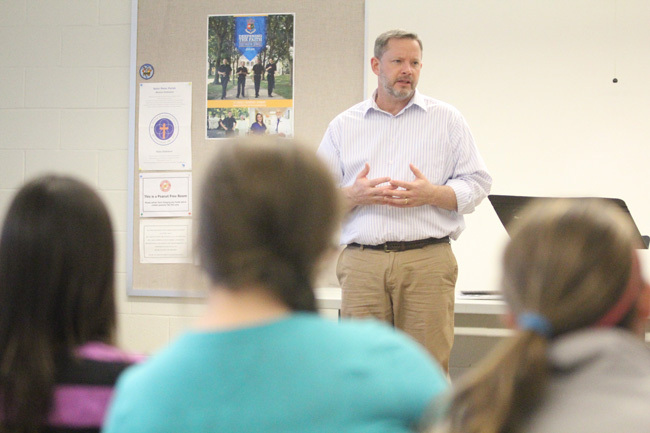 When the youth group at St. Peter Parish in West Brandywine started discussing the topic of mental illness and suicide, the Chester County parish’s Respect Life Committee decided to find a speaker who could confront the topics head on. 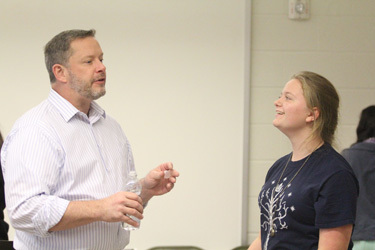 Committee member Tracy Phillips invited John Beaulieu, the director of partnership and engagement in the Christian Outreach Office of Franciscan University in Steubenville, Ohio, to speak at the parish. He did so on Sunday, Nov. 16 in two presentations, for youths and one for adults, each attended by about 30 people. In his talk Beaulieu, who has been affected personally by suicide after his brother-in-law took his own life at age 20, primarily emphasized a holistic approach to treating suicidal thoughts. This healing can only come through Jesus Christ at the Mass and in the Eucharist, he suggested, but he also implored those who suffer from manic-depression or bipolar disorder to get help through effective psychological counseling. Catholic teaching in the catechism describes people as “stewards, not owners, of the life God has entrusted to us,” and says suicide hurts the person who committed the act, other people, society and God. But it also says “grave psychological disturbances, anguish, or grave fear of hardship, suffering or torture can diminish the responsibility of the one committing suicide. We should not despair of the eternal salvation of persons who have taken their own lives. By ways known to him alone, God can provide the opportunity for salutary repentance,” signifying a favorable outcome for the soul. According to the American Foundation for Suicide Prevention, suicide is prevalent in the United States especially among middle-age and older adults. Statistics from the Centers for Disease Control indicate 40,600 suicides in the United States in 2012, the latest year for which figures are available. That makes suicide the 10th leading cause of death in the country. And its rate has been increasing since 2000 when there were 10.4 per 100,000, to 12.5 in 2012. Perhaps surprisingly, the highest suicide rate was among people ages 45-64 and the second highest was among those 75 and older. But among those 15 to 24 years old, suicide is the third leading cause of death, according to the National Alliance on Mental Illness. “More than 90 percent of those who die by suicide had one or more mental disorders,” the organization said on its website. People with grave mental illness “die on average 25 years earlier than other Americans, largely due to treatable medical conditions,” the website read. At St. Peter’s Beaulieu also spoke about the ripple effect of suicide, which hurts so many people including friends and family. He said suicidal individuals don’t desire death but instead they seek to stop the suffering they feel, sometimes because of the emotional pain of relationships. “When we love, we give someone permission to wound us like no one else can,” Beaulieu said. People should reach out to make connections with others, Beaulieu said, specifically those who suffer with depression and suicidal thoughts. He told the story of a young girl who saved the life of a young man by calling him at the moment he planned to jump off a bridge. This simple action, in which one person reached out to another in need, helped save the young man’s life and eventually led him to enter the Catholic faith the following spring through baptism. 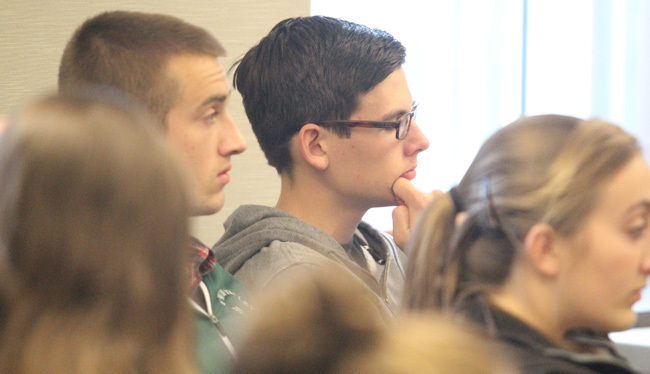 Suicide and its negative impact also affected some in attendance at the St. Peter’s talks. 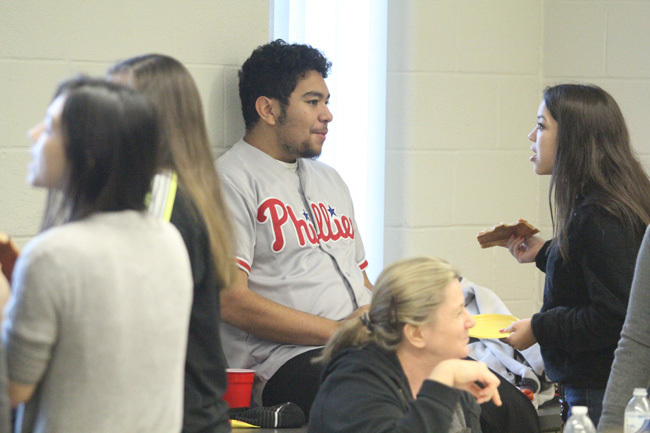 Phil Tran, an 18-year-old and treasurer for Bishop Shanahan High School’s Respect Life Club, said he knew a handful of people affected by suicide, depression and loneliness. He left the dialogue feeling he could help them by taking time to talk to those who suffer. “I feel called to do more,” Tran said. Peter Vanhor, 62 and a St. Peter’s parishioner, said he attended the discussion because of the topic’s recent resurgence in the news. The event followed the recent suicides of Oregon resident Brittany Maynard on Nov. 1 and actor Robin Williams on Aug. 11. Beaulieu made specific reference to Maynard. He noted the need to acknowledge the suffering of others and to treat their pain, but also to stand firm in Catholic teaching, by promoting natural death and suffering as a means to love, which unites people with Jesus. Brendan Monahan is a freelance writer in Plymouth Meeting. His email is bmonahan16@gmail.com. This is a wonderful idea that other parishes might want to follow. There needs to be more open discussion of behavioral health issues. So many people do not understand this disease and available treatments.